Le Guin was a towering figure in the field, famed for her fiction and non-fiction alike, with a career in SF that spanned more than 50 years. She was a Hugo Award nominee 23 times and won five, and won six Nebula Awards, with 18 nominations. 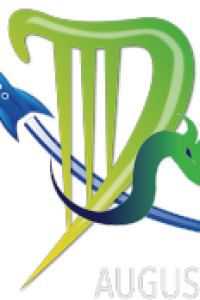 Other major awards included the World Fantasy Award for life achievement, the Eaton Award for life achievement, and the Pilgrim Award for lifetime contribution to SF and fantasy scholarship. Several of her works have been collected in editions from the prestigious Library of America. Le Guin began publishing SF in 1962, and wrote numerous major novels of adult and YA SF and fantasy, including The Left Hand of Darkness (1969), The Lathe of Heaven (1971), The Dispossessed (1974), A Wizard of Earthsea (1968), Always Coming Home (1985), Gifts (2004), and Lavinia (2008). Le Guin was equally adept as a short fiction writer, with countless influential and iconic stories, among them “Vaster than Empires and More Slow” (1971), “The Word for World is Forest” (1972), “The Ones Who Walk Away from Omelas” (1974), “Buffalo Gals, Won’t You Come Out Tonight” (1987), “The Matter of Seggri” (1994), and “A Woman’s Liberation” (1995). Her fiction collections were numerous and celebrated, among them The Wind’s Twelve Quarters (1975), Orsinian Tales (1976), Buffalo Gals and Other Animal Presences (1987), A Fisherman of the Inland Sea (1994), Unlocking the Air (1996), The Birthday of the World and Other Stories (2002), Changing Planes (2003), two volumes of The Unreal and the Real: Selected Stories, and The Found and the Lost: The Collected Novellas of Ursula K. Le Guin (2016). She also wrote for children, including the Catwings series, and numerous other pictures books, along with poetry, and plays. Le Guin was unparalleled as a critic, SF scholar, thinker, and social commentator. Important works of non-fiction include From Elfland to Poughkeepsie (1973), The Language of the Night (1979), Dancing at the End of the World (1989), Steering the Craft (1998), The Wave in the Mind (2004), Words are My Matter (2016), and No Time to Spare: Thinking About What Matters (2017). She also edited anthologies. Le Guin was the subject of numerous academic and critical works, among them The Farthest Shores of Ursula K. Le Guin, George Edgar Slusser (1976); The Left Hand of Difference: Le Guin & Derrida, Robert Scholes (1983); and Ursula K. Le Guin, (1986) and Ursula K. Le Guin’s The Left Hand of Darkness, both edited by Harold Bloom (1987). Her friends Karen Joy Fowler & Debbie Notkin edited 80! : Memories & Reflections on Ursula K. Le Guin in 2010. Ursula Kroeber was born October 21, 1929 in Berkeley CA; her mother was renowned writer Theodora Kroeber, and her father legendary anthropologist Alfred L. Kroeber. Le Guin grew up in Berkeley, spending summers in the Napa Valley. She attended Radcliffe College, earning a BA in French and Italian Literature in 1951 and a MA in the same subjects at Columbia in 1952. She was a Fulbright Fellow in 1953, working on a PhD in France from 1953-54. While traveling in France, she met Charles A. Le Guin, and they were married in Paris in 1953. They returned to the US, where Le Guin taught French at Mercer College and the University of Idaho. The family moved to Portland OR in 1959, where Charles taught at Portland State University; they remained there for the rest of her life. She taught writing at Clarion West, Portland State University, Reading University in England, Tulane University, Bennington College, Stanford, San José State University, and many other programs. She is survived by Charles, their three children, and four grandchildren. A more complete obituary, plus photos, appreciations, and celebrations of her life, will follow in our March 2018 issue. 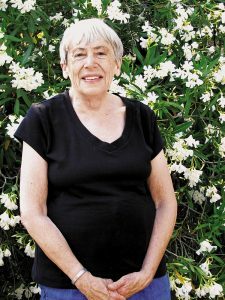 For more about her, see her extensive website at www.ursulakleguin.com/UKL_info.html. I’m so sorry to hear that – she’s always been somewhere on my shelves. Time to get The Dispossessed off once more. My condolences to her family and close ones! I always feel a bit silly when I deeply feel the loss of a person I didn’t really know. But I was privileged to interview Le Guin once, and I could not keep the tears from my eyes when I learned this evening that she has died. She lived a remarkable life. She was brave, unafraid to stand against the prevailing forces of our time, and her time. She was the most ethical writer I’ve ever read. I will truly miss knowing that someone as fine as she occupies the same planet as I. I have, for years, called her my “guidestar,” and now she’s gone. I have no right to feel the loss so deeply, but I do. In an alternate universe, UKL was feted as the winner of the Nobel Prize, for her enormous contributions to world literature. I was hoping to be able to live in that universe. I’m sorry that I’ll never make it now. I am glad I did not read this news online. A friend told me on the phone. I have been aware of Ursula K. Le Guin ever since I saw the SFBC ‘Things to Come’ brochure in September 1969 for THE LEFT HAND OF DARKNESS (the Walker edition was the October main selection). I could write all night about what she meant to me, but I will just say that I am a different person for knowing her work. If I had to pick one piece by her that has meant the most to me, it would be ‘The Ones Who Walk Away from Omelas’ (originally published in NEW DIMENSIONS 3, 1973). Please edit the obit to indicate that ORSINIAN TALES (1976) is a collection, not a novel.